United States Army Signal Corps and Signal Center are located near Atlanta GA at Fort Gordan. Both the schools and the operational units involved in signals, electronic warfare, cyber, cyber-security are all located here and components of the Army Cyber Center of Excellence (CCoE). The main component of the post is the Advanced Individual Training (AIT) for Signal Corps military occupational specialties. The U.S. Army Signal Center and Fort Gordon,"The Home of the Signal Corps," train more soldiers than any other branch training center of the United States Army. The Signal Corps has evolved since its inception in 1860 as communication technology has evolved. Personnel in the signal corps support the command and control of combined arms forces in every imaginable method of communications. Signal support includes Network Operations (information assurance, information dissemination management, and network management) and management of the electromagnetic spectrum. Signals also involves designing and installing data satellite communications networks, microwave, switching, messaging, video-teleconferencing, visual information, and other related systems. Signals Corps personnel supports tactical, strategic and sustaining base communications, information processing and management systems into a seamless global information network. The Signal Corps manages designated Department of Defense communications assets. Electronics related to the planning, design, engineering, operations, logistical support and evaluation of systems and networks. Directs and manages the installation and operation, of networking and maintenance of signal equipment. The Signal Corps also develops requirements for the design and implementation of data communications systems and networks. Signals personnel establishes, prepares, coordinates and directs programs, projects, and activities engaged in unit level supply, maintenance, and life-cycle management of signal materiel. Experience in the business of the Signals Corps gives personnel invaluable training and job skills in the civilian business market. 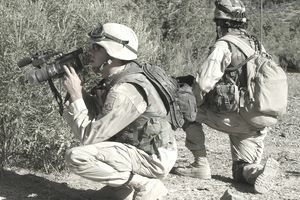 Having experience in controlling units and activities involved with the application of electrical, electronics, and systems engineering and management principles, in the design, test acceptance, installation, operation, and maintenance of Signal systems, equipment, networks, and facilities is a highly valuable field within the military and in the civilian community.